Do you like our picture book tree skirt? I gathered up all of our winter and Christmas titles so that we can start reading some of the books together every night in December. 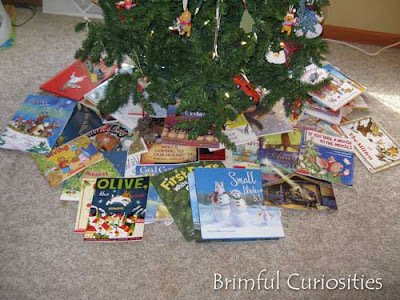 Someday I'd love to make an Advent calendar out of books, like the one on the Jolly Mom blog. However, this year we will count down to Christmas by reading holiday and winter themed books from A-Z (1-25). This is not meant as a "best of" list. All the titles in my list are from our home library (some I purchased and some are copies received for review). I have a few empty letter entries, so if you have any suggestions for those letters, please let me know. I'll need to make a trip to the library if we hope to complete our A-Z Christmas book challenge! What are your favorite holiday or winter themed picture books? We continue to expand our collection every year and would love your suggestions. Any newly published ones you are hoping to buy this year? Great idea! Super list too. I can't think of any that fill in the missing letters though. Wow! Cool idea. I will keep my eye out for Q, U, and Z. We love Elmo's 12 Days of Christmas, a muppetized version of the traditional carol. Who's That Knocking on Christmas Eve is (I think) a Ukrainian folktale ... that might give you the "U". I love the Auntie Claus books, too. Great message. The Miracle of the First Poinsettia is also a very lovely book. The story is great, but the illustrations are incredible! the link post should appear on my blog in about an hour. What a great idea! You made me wonder how many Christmas books we have. I came over to thank you for entering my giveaway and found your wonderful blog. By entering "Zelda Christmas book" into my search engine, I discovered "Zelda and Ivy:One Christmas," by Laura McGee Kvasnosky. It looks worth checking out. Maybe this would work for Q: "Winter Lights: A Season in Poems & Quilts" by Anna Grossnickle Hines. I haven't read any of the poems, but they are apparently about winter celebrations and accompanied by beautiful quilts.